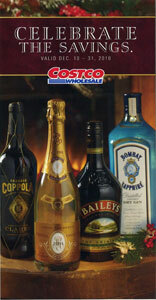 At stores in CA, AZ, and NM Costco is passing out a coupon book good for several different types of wine and spirits. This December alcohol coupon book is good from the 10th to the 31st. It is perfect for the holidays, as it has spirits for your favorite holiday drink, such as Grand Marnier and Baileys. It also has some great bottles of champagne on discount, as well as some nice bottles of wine. Check it out at the link above. Anything that stands out to you in the book?